After spending a day recovering and visiting some Green Mountain Grill dealers in the area, we were ready to get back to our BBQ crawl. 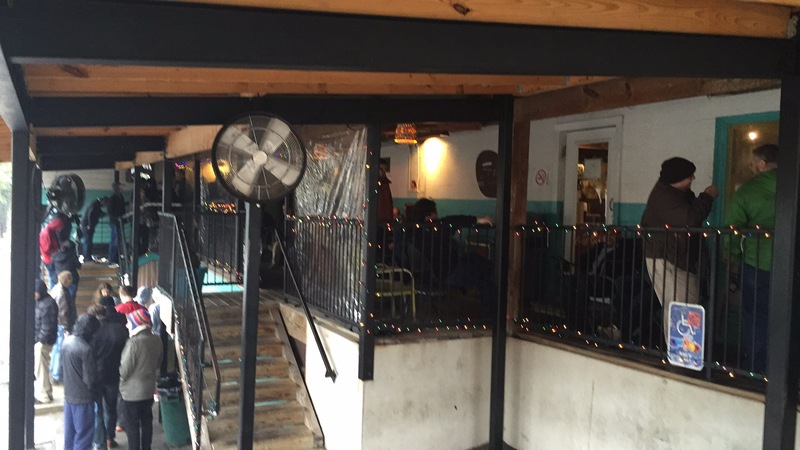 We really lucked out when we woke up and it was raining, the perfect day to eat at Franklin BBQ in Austin. Franklin BBQ is known for their long lines starting at 8:30 in the morning even though they don’t open until 11am. We were amazed when we pulled in at 10 am with only about 30 people ahead of us, this was unheard of. The line at Franklin’s is even more astounding when you learn they have only been around for 6 years, after visiting Lockhart with its vast history it was good to know that BBQ is alive and growing with places like La Barbecue and Franklin’s. The staff was by far the friendliest we had come across, even waiting in line they had employees come out and talk with the crowd. They reassured us that there was plenty of food and took everyones order to ensure this was true. We mentioned we were a competition BBQ team and were doing a blog on Texas BBQ and they invited us to come back to the pits to see what they were cooking after we ate. 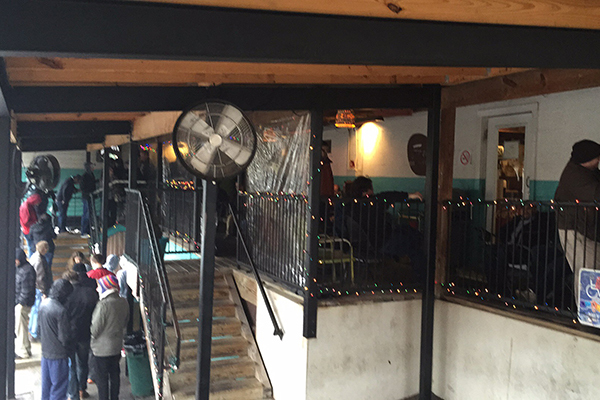 The line moved really quick through the retro trailer park decor they have set under the porch of the building. We moved inside and our plans of getting a 1/4lb of sausage and a 1/4 of briskets quickly changed as we saw everyones tables covered with the most amazing BBQ we’ve ever seen. We’ve all seen photographs of great BBQ in magazines and there is always a food stylist behind those photos, but the BBQ at franklins beats all those with there perfect presentations. We sat down and admired the food before digging in. 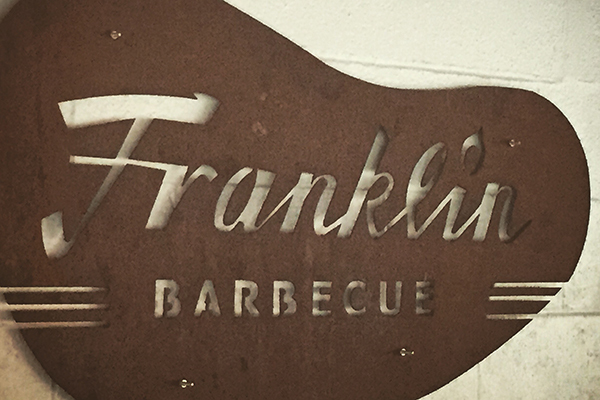 There is really nothing to say about Franklin’s BBQ besides it being THE PERFECT BBQ. This is a must stop if you are in Austin or even within 100 miles of Austin. 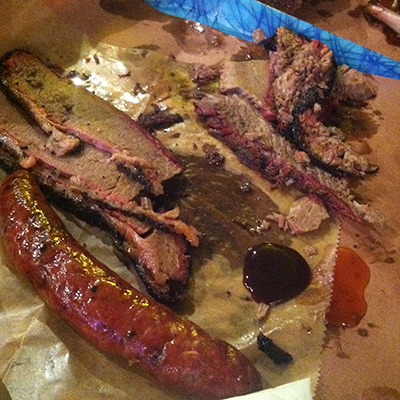 Still reveling in the amazingness of the BBQ we just ate, we headed behind the counter into the pit area. 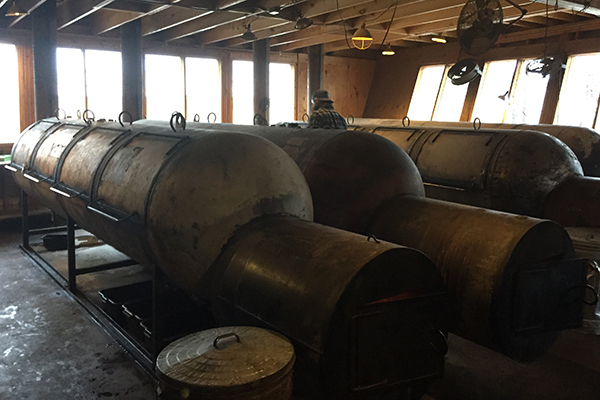 It was a site to behold, 1000 gallon tanks transformed into smokers filled the screened in room, All of them had burning oak in the firebox, We got a chance to look at the briskets that were cooking for the next day, everyone of them a work of art. 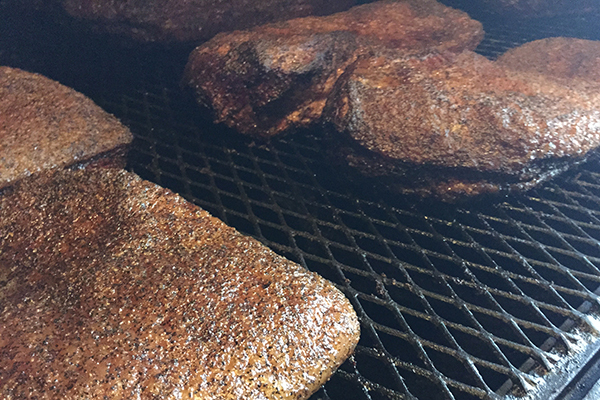 Our next stop la Barbecue was right around the corner. Again with the rain there was no one in line though we got a little wet it was well worth it. The brisket was on par with Franklin’s and even though Im not a big sauce fan when it comes to beef la Barbecue was my favorite. 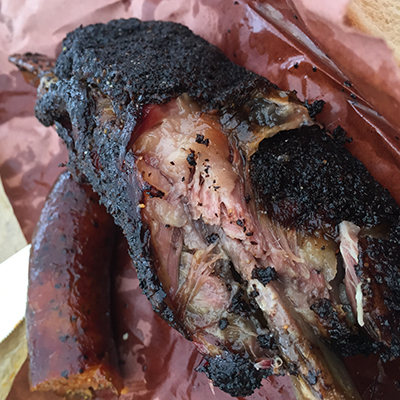 But the best things about la Barbecue was the massive tender beef rib and the spicy sausage which was different then all the others we had. 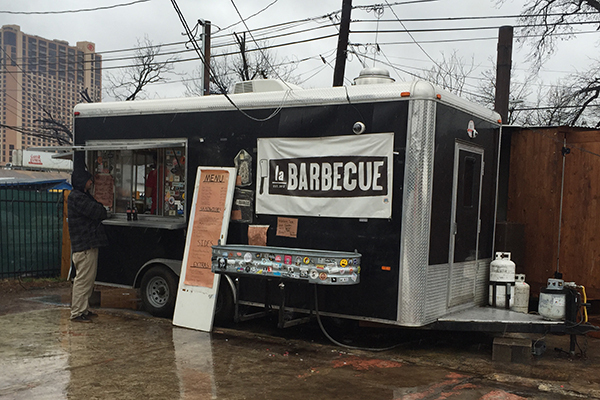 la Barbecue is comprised of two trailers in food truck park, one trailers used exclusively for cooking on their massive smoker inside. We sat down at our last BBQ meal enjoying the rain and planning our next trip back. We headed back to start loading up for our BBQ Competition in Helotes Texas the next day. With GMGs in the back of the truck we made our way down deeper into Hill Country. We arrived and entered the dirt lot filled with smokers of all kinds. We prepped our meat and spent the day talking BBQ with some of the locals. 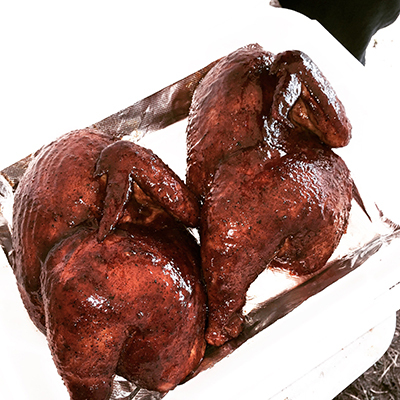 The GMGs did their job overnight in the cold weather and we had a great cook for our first time cooking in Texas. 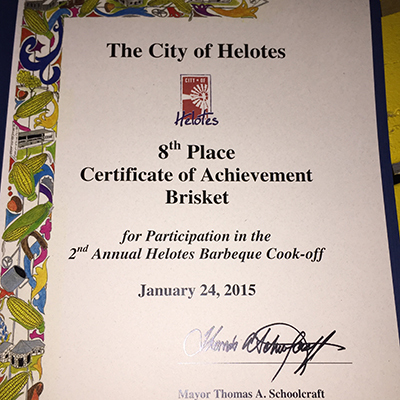 When it was all said and down we were able to finish with an 8th place brisket out of 88 teams. Getting a call in brisket in Texas was more then we could have hoped for gave us the boost we needed to make the long drive home. Thank you for following us on this journey. If you plan on making your own trip and have any questions please comment below. Here is a video of our trip. Enjoy! Thank you for following our adventures into Texas.